The world’s highest mountain has lured visitors from all over the world ever since its discovery. Attempting its summit is dangerous and requires special skills and experience, as explained in our guidebook dedicated to the climb. However, the trek to its Base Camp in Nepal can be completed by well-prepared walkers of any age – safely and enjoyably. The views from the route are breath-taking, and the trek is punctuated by intriguing Buddhist monuments and monasteries. In the aftermath of the earthquakes in April/May 2015, Nepal needs trekkers more than ever. 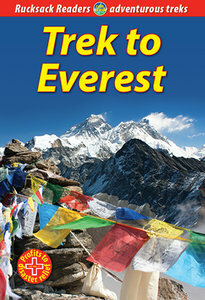 Profits from the sale of this book are being donated to Mountain People, a respected charity that helps the mountain people of Nepal to help themselves. The authors focus on the popular route from Lukla to Base Camp, but they also include the trek to the beautiful Gokyo Lakes with the challenging option to link the two valleys over the Cho La pass. They provide background on Sherpa culture and religion and on wildlife and geology. There’s a wealth of information on practical aspects of trekking and preparation, including how to prevent and manage altitude sickness. In October 2016, this guidebook won the Award for Excellence from the Outdoor Writers and Photographers Guild.